Our Abpromise guarantee covers the use of ab9512 in the following tested applications. IHC-P 1/100. Perform heat mediated antigen retrieval via the microwave method before commencing with IHC staining protocol. Forms a water-specific channel. Osmoreceptor which regulates body water balance and mediates water flow within the central nervous system. Brain - muscle >> heart, kidney, lung, and trachea. Belongs to the MIP/aquaporin (TC 1.A.8) family. Aquaporins contain two tandem repeats each containing three membrane-spanning domains and a pore-forming loop with the signature motif Asn-Pro-Ala (NPA). Phosphorylation by PKC at Ser-180 reduces conductance by 50%. Phosphorylation by PKG at Ser-111 in response to glutamats increases conductance by 40%. 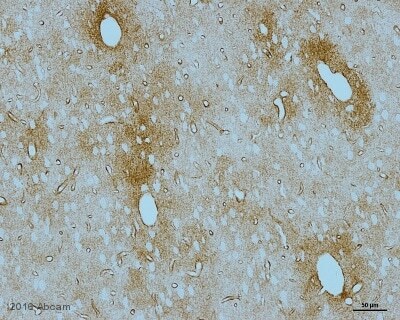 Immunohistochemical staining of aquaporin 4 in rat brain. Immunohistochemistry (PFA perfusion fixed frozen sections) - Anti-Aquaporin 4 antibody [4/18] (ab9512)Image from Glover LE et al., PLoS One. 2012;7(3):e33646. Epub 2012 Mar 16. Fig 5.; doi:10.1371/journal.pone.0033646; March 16, 2012, PLoS ONE 7(3): e33646. Immunohistochemical analysis of mouse brain tissue, staining Aquaporin 4 with ab9512 at 1/100 dilution. 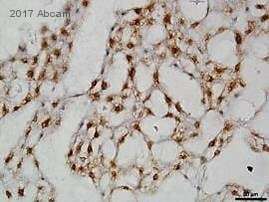 Staining was detected using a biotin-conjugated anti-mouse antibody followed by FITC-conjugated streptavidin. Publishing research using ab9512? Please let us know so that we can cite the reference in this datasheet. Faint band first blot, primary antibody 1/500 overnight. that the problem is the AQP4. Thank you for this information. It is unusual for one to see a band and then subsequently see nothing, which is why I thought you may have been stripping and re-probing. You may improve your result by increasing the concentration of the primary antibody further. Generally the actin band will always be a lot stronger since it is a highly expressed loading control. We can send you a free of charge replacement of the antibody if you wish to try a new lot. Please let me know if this is satisfactory. Thank you for taking time to complete our questionnaire. I am sorry to hear that this antibody is not providing satisfactory results. The details provided will enable us to investigate this case and will provide us with vital information for monitoring product quality. 1. As this is a multipass membrane protein, which tent to aggregate in the loading buffer when boiled at high temperature due to their hydrophobic nature, I would like to recommend lowering the boiling temperature down to 60C, but keepingthe boiling time of10 min. In addition, use DTT instead of beta-mercaptoethanol as this kind of aggregation is favoured by b- ME. 2. Please be aware that there are two isoforms of this protein, one is 29 and one is 35 kDa. 3.For a better saturation of the membrane, I would recommend a blocking buffer containing 3% BSA for 2 hours at room temperature. BSA can sometimes give better results than milk.Please use the same agent during antibody incubation. 3. In order to increase the specific binding, I would like to recommend decreasing the antibodies concentration down 1:1500. Should the suggestions not improve the results, please do let me know. In the event that a product is not functioning in the species and applications cited on the product datasheet (and the problem has been reported within 6 months of purchase), we would be pleased to provide a free of charge replacement, credit note, or refund. I hope this information is helpful, and I thank you for your cooperation. Thank you, that is useful, and we will probably go ahead with the peptide. I checked the price of the peptide, and it was quoted to me as $190, more than 3 times the cost of peptides we have ordered from other companies (santa cruz peptides cost ~$60). Is there a reason for this difference, are we able to order this peptide for a competitive price? Here are 3 different competing peptide for competing antibodies and their price comparison. 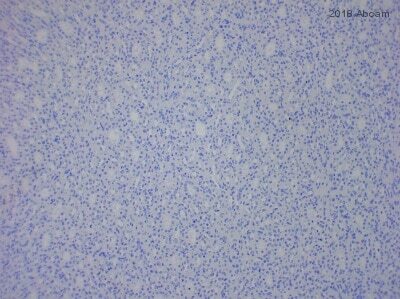 FOXM1 (C-20) Psc-502 P (peptide) 100 µg/0.5 ml$61(73AUD) AR (N-20) Psc-816 P (peptide) 100 µg/0.5 ml$61(73AUD) PR (C-20) Psc-539 P (peptide) 100 µg/0.5 ml$61(73AUD) Is there any way that we would be able to offer the customer a better price? ($190 is the AUD price for the customer). We realize that our products can be considered to have premium price point. However, we feel that the product and service which we offer are of the highest possible quality. Under our Abpromise guarantee, ourproducts are guaranteed to work in the manner stated on the datasheetfor a period of six months. If you experience any difficulties using our product and if you have purchased this product within the last 180 days, we are happy to provide scientific support, refund or replacement. We do offer bulk discounts for orders of 10 units or more, and often run promotions for a number of product types. Please see our website or speak with customer service representative for more information about these. I hope that this information is helpful. Please let me know if you have any questions or there are other ways that Abcam may help you meet your research goals. I have now run 2 westerns with the new AQP4 antibody (ab46182), resulting in 3 sharp and clear bands, using 25micrograms of protein and at a much lower concentration than used previously with the other antibodies (1/4000 dilution works well). My only concern is whether the bands are in fact the correct size. The bands produced are ~29kDa, ~38kDa, ~49kDa. This is in contrast to the predicted 35kDa band, and observed 46 and 48kDa.Would you have any explanation for why this is ocurring? Or have any suggestions as to how we could verify the specificity of the antibody? I was considering using the aquaporin-4 peptide (ab46181) as a negative control to check the antibody's specificity. Thank you for contacting us. I am glad to hear that this replacement product is performing better than the last product. Many factors can alter the predicted molecular weight of a protein. These may include post-translational modifications, protein processing, isoforms from alternative splicing, multimer formation, and amino acid charge. Non-specific binding of an antibody to proteins other than the antigen can sometimes occur. This is usually more common with polyclonal antibodies, but can also occur with monoclonals as well. 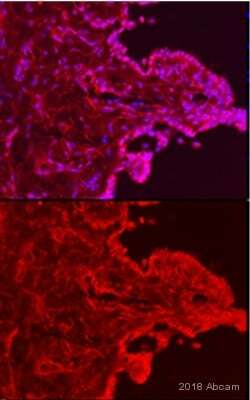 An immunizing peptide blocking experiment can be performed to determine which band or staining is specific. As you have mentioned, this product's immunogen is available for use as a blocking peptide. I would recommend using this if you are concerned about the specificity of this product. In case you would like more information regarding the use of blocking peptides, I have included Abcam's protocol for blocking with the immunizing peptide. Hi Abcam, Please see below an email we have received from the same customer; I have tried the new lot that was sent, and while I did have some success (a faint band) with this antibody using a very high concentration (1/50) on rat brain tissue, I cannot get it to work on spinal cord tissue. Would it be possible to try a new antibody? The customer wishes to try AB41862 or AB81355, for WB using rat spinal cord tissue. They asked if you would recommend one over the other? I would like to reassure you that our antibodies have all been tested successfully and would be covered by our guarantee in the applications listed on the datasheets. Therefore, any Aquaporin 4 antibody tested in the species and application you are using should be suitable for your applications. Also, although we produce many in-house antibodies, we obtain other antibodies from a wide range of sources. Therefore, comparison experiments will not often have been done. I would recommend that when a user is deciding upon a product that they look for those products which have Abreviews and have been used in publications, if possible. When choosing an antibody to be used in Western blot or Flow Cytometry I would also recommend choosing a product which has either a peptide available or the peptide sequence published as the peptide can be used for blocking if necessary. Please let me know which product your customer would prefer. I look forward to hearing from you. Should you have any further questions please do not hesitate to ask. I have asked that an FOCR be created for ab9512 of a different lot number. You should be receiving confirmation shortly and it should be included with your next order. Please let me know if you have any questions.